Jeffrey’s first musical experience was listening to pop 45’s. 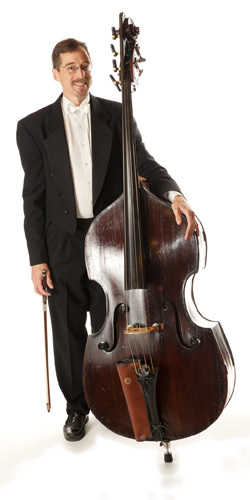 He chose to play the Double Bass at age 12. Later in his youth, a foster father (who built and played pipe organs) took him to each Chicago and Milwaukee Symphony concert that played in Milwaukee. He went through intensive training at one of the nation’s first visual and performing arts magnet school programs. He studied bass with Roger Ruggeri, and the wonderful Karel Netolička (first and second chair bassists in the Milwaukee Symphony). Jeffrey was first chair in the UW and the Milwaukee youth orchestras and traveled abroad to the international festival of youth orchestras in 1980. He played throughout the Milwaukee region performing music from baroque to the avant-garde. At 23 Jeffrey joined the musical group at local Milwaukee landmark Stari Grad Serbian Restaurant where he first encountered world music. This group had a repertoire of the widest possible variety of music from many nations. (He first encountered the Cimbalom among the instruments in that group.) After moving to Tucson to work as Assistant Principal Bass with the Tucson Symphony, he continued his studies with Patrick Neher and completed his bachelor’s in music at the UA. Mr. Holsen has also studied at master classes and seminars given by many other well-respected bassists. Mr. Holsen currently teaches five students. He belongs to a group in Tucson which plays Klezmer music; another which plays Balkan music; performs jazz freelance; and enjoys playing with the University of Arizona’s Balalaika orchestra. His musical hobbies include ethnomusicology, jazz, and collecting bizarre recordings. His non-musical hobbies include hiking, swimming, camping, yoga, reading, and good food. Jeffrey has performed with The Tucson Symphony, The New Mexico Symphony, The Tucson Pops, The Tucson Community Chorus, The Tucson Boy’s chorus, Tucson Masterworks Chorus, Waterloo Music festival, Orchestra Stari Grad, the Klezmopolitans, the UA Balalaika Orchestra, Finestream Gamelan, the Molehill Orkestrah, Balkan Spirit (trio with cimbalom), Gabriel Sullivan & the Taraf de Tucson (with cimbalom), Seido Salifoski & Mansur Hatic’ (at the East European folk life Balkan gathering), Matt Mitchell, Susan Artemis, Jeff Grubic, Howard Wooten, Todd Hammes, Mark Mantel, Scott Jeffers, and many others. I do not own an iPod but I have one of the most unusual record and CD collections that I know of anywhere. Public middle school orchestra as a performer. Milwaukee Symphony Orchestra as an audience member. Because I love low tones. I really enjoy Baroque music. I enjoy Slavic music. There is a lot of music I would like to see TSO perform such as Miaskovsky’s 6th, Martinu’s 2nd, big works by Enesco and Bartok, More Sibelius, Mahler 9 & 10 (which I have yet to play), Nielsen, Walton, Brian’s “Gothic” I would like to see us do some Tan Dun and maybe some Arvo Part. I would love to perform Gorecki’s 3rd. I generally enjoy works that use the bass to good effect. (Some do and some don’t!) I also enjoy anything that allows me to play Cimbalom. There is a body of works both new and established for that instrument. I actually do a fair amount of non-classical music, including jazz and various ethnic and local music projects. My other instrument is the “Cimbalom” Non-music activities? I Read (Politics, philosophy, history etc.) Swim, exercise, camp, vegetarian and super healthy food, meditate, community engagement on various levels. I really would need to do a biography to totally answer this question.